Twenty-one Newcastle AC athletes made the journey down to a cold and sunny Dublin for 39th annual Dublin Marathon. With entries sold out by early summer, it was a long summer training schedule, with numerous runs as far away as the Windy Gap, Drumaness, Ballykinlar and Cabra this year for the more serious runners in the club. For others the staple was numerous laps of the lake or repeated jaunts to Castlewellan and back. Following a Mexican standoff in the coffee dock two weeks earlier, Dee Murray declared that “East Down’s top 7 would beat Newcastle’s Magnificent Seven.” There was a lot at stake to see who would win the battle of the coaches. With excitement building the pundits predicted that there was a real possibility that the Magnificent Seven could all break the magical three hour barrier. Running his second marathon in six weeks (a quiet autumn on the marathon front! ), Patrick Higgins went through half way exactly on 2:35 pace. He ran out of juice in the latter stages and cruised home for a time of 2:40 – a great achievement when added to his 2:36 in Berlin. Third man and final counter in the team prize was the always dependable Aidy Brown. After an extremely strong season at the cross country and outings at the Derry and London Marathons, the first thing Aidy probed after finishing also in 2:57 was, “where’s Higgins and that Frank man running next?” No-one was surprised when ‘Wee Brown’ was nipping home early from the celebrations to get his entry in for Belfast next year. Francis Tumelty was the next man home in 2:58, making it his third sub three marathon. The Ross Rocket continually chips away and improves his marathon at every outing. Backed by his loyal Ardglass supporters who travelled down by the busload, it is little surprise the quiet gentleman has the loudest fans. Irish International Sinéad Murtagh is the newest addition to the sub three hour club. After making her International Mountain Running debut in Andorra 6 weeks earlier, Murtagh can now add her Sub 3 membership card next to the framed Irish vest on the mantelpiece. Murtagh also claimed the Newcastle & District’s female marathon record by a mere 8 seconds which Mari Troeng set only 6 weeks earlier and was unanimously awarded the woman of the match award. 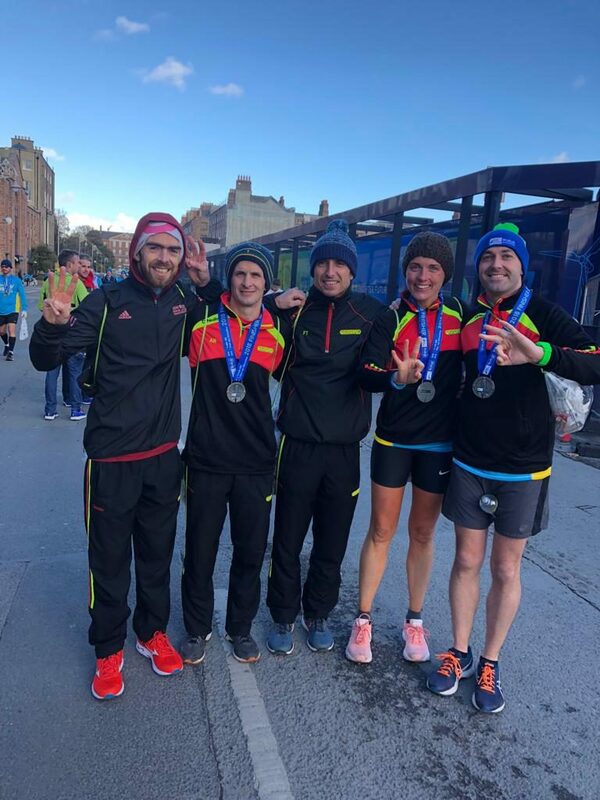 With five runners under three hours, this was most successful marathon in recent club history. Almost, but alas still not quite! Dublin 2018 was Season 8 of Noel Gallagher’s journey to break the three. Finishing in 3:02, this drama has had more seasons than Game of Thrones. Just like Westeros, it appears that a 2:59 remains a fantasy. Let’s hope it won’t take as many episodes as Little Britain for him to join the Exclusive Run Club. Despite his now mandatory trials and tribulations in his quest for the Holy Grail, there is no one more joyful for his club mates than Wonderwall. Not one to dwell on what has passed, Wonderwall was in fine fettle in O’Donaghue’s and overjoyed at the accomplishments of his peers – never a man to dwell on what has gone behind him. Despite struggling with injuries throughout 2017 and 2018 The King of Cabra, Kieran Morgan performed well all day. Miley brought home the bacon in a strong 3:06, a time that would have been good enough for second Newcastle Runner home in 2017. This shows that all the long runs on a Sunday morning have paid dividends for the ‘Magnificent Seven’. Running faster than his pizza order the night before Niall King went out hard and deserved a better time than his 3:12. With a Boston 2019 entry secured, there is no telling what this man could do in April 2019. Niall and ‘Butcher’ Kelly started a new program drawn up by former Bangladesh Cricket International Roman the following morning, specifically designed to improve the final 800m and 400m of any race. Relatively new signing Michael Englishby went through half way on schedule for a 3:10, before slowing slightly in the latter stages to come home in a strong 3:18, taking over 34 minutes off his time from last year. Also taking over 30 minutes off his 2017 Dublin time was Ruairi Donnelly who came home in a highly respectable time of 3:25. Donnelly learned from going out too hard the previous year and adopted a much more sensible and conservative approach to the event. Twenty six seconds later, the amazing Ashlene Mussen crossed the line also in a time of 3:25, improving by 10 minutes on her time from a scorching run in the searing heat of London in April. There is no doubt that Mussen will go faster again when she next toes the line. Her extremely consistent training was undoubtedly her greatest strength and this instilled a sense of self-belief that enabled her to thrive. Richard Rodgers followed close behind in 3:27, taking six minutes of his London time. Despite injuries late in the summer, Coach Rodgers is like a fine wine, getting better with age. Given that a few weeks before the event he was no more than a ‘possible maybe’ he put into practice the lessons he teaches athletes about determination, perseverance and resilience. After dining out on minimal portions of a leg of goldfish the night before, Butcher Kelly ran on little miles in the bank and little food in the tank. The waiter may have given Butcher lemons, but he sure made lemonade. A time of 3:35 shows that if Butcher could sort the difficulties with his knee, there is no reason this man couldn’t break three hours again. His training may have been intermittent and sporadic, but his attitude and commitment were impeccable. One has to stand back and admire the tenacity of NACs ‘Prison Break’. Marathon debutant Lorna Cunningham ran an impressive 3:37. Running through the first half with Captain Parkrun in a time of 1:50, Cunningham recorded an impressive negative split in the second half of 1:47. When asked how she managed to do it, Cunningham explained her sole motivation was to get away from McCann as quick as possible! Powered by Jelly Babies that kept emerging from a seemingly bottomless secret stash, Cunningham was faithful to her schedule and powered to the line with great aplomb. Her main dilemma after crossing the line was whether to look for a gym or hairdressers or both! Charlie McAlinden took the morning off from walking every dog in South Down to travel down to indulge in his 30th marathon. Breaking 3:40 yet again, McAlinden was 22nd in the Men Over 60 category and is already planning his next marathon. Needless to say Charlie’s pacing was metronomic throughout and his fuel strategy second to none. Peter Morgan took himself off whatsapp for the morning to run an impressive 3:49. With a winter of Thursday night sessions under his belt there is no doubt Morgan could get close to a 3:30 in 2019. Jinxy Farrell managed to put the curse of Dublin to bed. After a big blow out previously, when he recorded 4:30 but still finished, Jinxy left nothing to chance and followed the ultra-reliable Rita Devlin to a well- deserved and hard- earned 3:52. Declaring that he was ready to race Higgins at the Castlewellan Hill & Dale, Jinxy was leading the cheers of “there’s only one Jinxy Farrell” in ‘Coppers’ that night before trying to catch a good night’s sleep. Despite her relative youth and inexperience, Kerri Valentine was competing in her third marathon. She went through half in 2:16. With a faster final 7 miles she finished in a credible 5:13. For such a young and determined athlete, with consistent training and commitment, she has the potential for great times in the future. Despite 21 starters, only 20 made it to the finish. Sadly, Joe McCann had enough at 20 miles and had to call it a day, Cutting Lorna loose, the coach’s job was done, and all that remained was the lonely walk to the finish to collect the kit, but no medal or finisher’s t-shirt! The runners sincerely wish to thank all the supporters, too many to thank individually, who came down on the day. They ran, walked, cycled and drove round the course on a chilly day. They shouted, screamed, waved flags, rang cowbells and caught gloves. Every runner was humbled by the support they received. This support was also doled out in generous abundance to the athletes from both local clubs and those further afield. On seeing a Newcastle vest there were would be loud shouts of ‘co’mon Toon’, ‘go on Nu Cassle’ (best read with a deep Greodie accent) and ‘Howway the Lads’ No-one had the energy to correct them! Dublin crowds are knowledgeable and generous in their support. These factors are invaluable in helping those enduring the final few miles to make it to the line. 2019 will be the 40th Dublin Marathon and 7,000 of the 20,000 places are already sold. No Doubt NAC will be well represented once again.